If you make these cookies–which I highly encourage you to do–don’t be alarmed by the amount of chips in the dough. The first time I made them, I didn’t think the cookies would be able to hold together. I even had to scoop loose chips out of the bottom of the bowl and pack them into the dough because there were so many. That’s all part of the beauty of these cookies, though. Chips, chips, and more chips! Not only will your cookies hold together, but they will be that much better for the chips popping out of every surface. Normally, I wouldn’t encourage you to use just one kind of chocolate when you could use two, but I really couldn’t tell the difference between the semisweet chocolate and the dark chocolate chips. There were so many crowded together that they all just tasted chocolate-y. That’s not a bad thing, but I think you could get away with just using one kind of chip if you didn’t feel like buying two different kinds and having two open bags. Someone suggested making these with white chocolate and dark chocolate. I’ve never tried that, but it sounds good. P.S. When I brown butter, I like to swirl the pan slowly and continuously once the butter is mostly melted. It’s a little hard on the wrist, but I’ve never had a problem with the butter burning. Hello! I know it’s been a while since we’ve seen each other, but I have a new cookie recipe absolutely too fabulous to keep to myself. Let’s skip the catch-up chitchat (Chit chat? Chit-chat?) and just talk. Let’s talk about white chocolate macadamia nut cookies. “Oh. My. Gosh,” after the first bite of one of their cookies. Just please make these. You’ll know what I mean! These white chocolate macadamia nut cookies are buttery and crispy around the corners but tender in the middle. They are vanilla-y and white chocolate-y and nutty. Actually, macadamia nuts have kind of a mild flavor. I guess these aren’t super nutty after all. They’re pleasantly nutty, though. I’m getting off on a tangent. I apologize. “Wow! It smells amazing in here!” When I offered them a cookie, they both had the same eyes-rolling-into-the-back-of-their-heads reaction that I did. Success! I baked up a batch of room temperature dough and a batch of dough that had been refrigerated overnight. While I found it easier to gauge the doneness of the room temperature dough cookies, the refrigerated dough cookies baked up golden, craggy, and visibly bursting with white chocolate and macadamia nuts. Baked both ways, the cookies taste fantastic. I personally liked how the chilled-dough cookies looked better, but the other ones were still extremely pretty. They were just smoother and not as tell-tale of the glory hidden inside of them. I baked the chilled-dough cookies until they were golden brown around the edges and had patches of golden brown on top. The tops had a shiny, done-looking crust that held up when pressed lightly with my fingertip. I could still feel some softness underneath. In my oven (turned down a little over twenty-five degrees), I ended up baking each pan for about ten and a half minutes, rotating the pan halfway through. I baked the room-temperature dough cookies until they were golden around the edges and lightly golden on top with darker patches beginning to turn golden brown. When pressed lightly, they felt puffy and soft. Each pan spent about nine minutes in the oven, getting rotated about halfway through baking. I know (at least around my house) macadamia nuts can sometimes be a little hard to track down. I found Diamond chopped macadamia nuts sold in ½ cup packages in the baking aisle at Target. Even though the nuts were already chopped, I ended up chopping them a little more since some of the nuts appeared to be whole. I also, as always, bought three (four ounce) white chocolate baking bars and roughly chopped them instead of using the “white” chips sold at my supermarket. I could continue to enumerate on the deliciousness of these cookies, but, as Briscoe Darling would say, eating speaks louder than words. 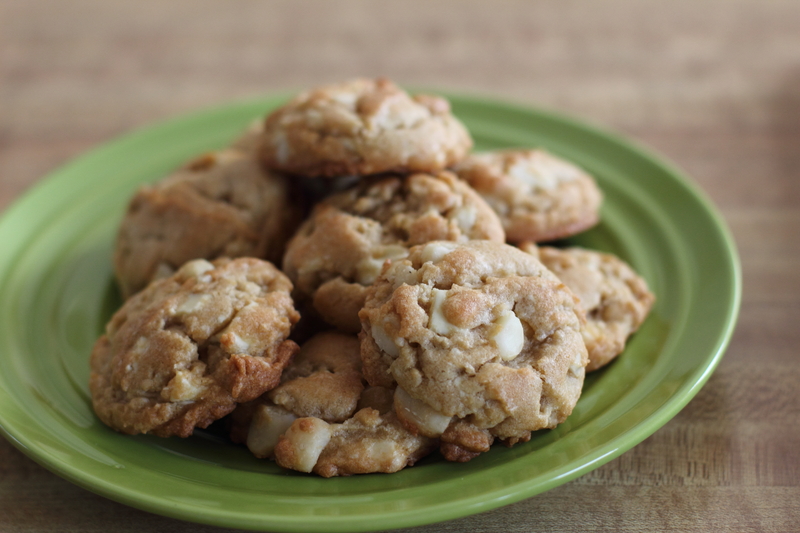 These white chocolate macadamia cookies are disappearing fast! I’m back from my unintentional holiday hiatus from blogging. Now that it’s 2014, and things have settled down, I felt inspired to snap my 50mm prime back on my camera and photograph these little treats. I hope all of your holidays were lovely and blessed! Well, I finally did it! I finally made brookie muffins! I can’t believe I’ve waited this long to make these. I mean, brownies and cookies in the same dessert? Come on! What have I been waiting for? To make the brookies even more fun (and tasty), the cookie dough isn’t just chocolate chip cookie dough, but peanut butter chip and chocolate chip cookie dough. 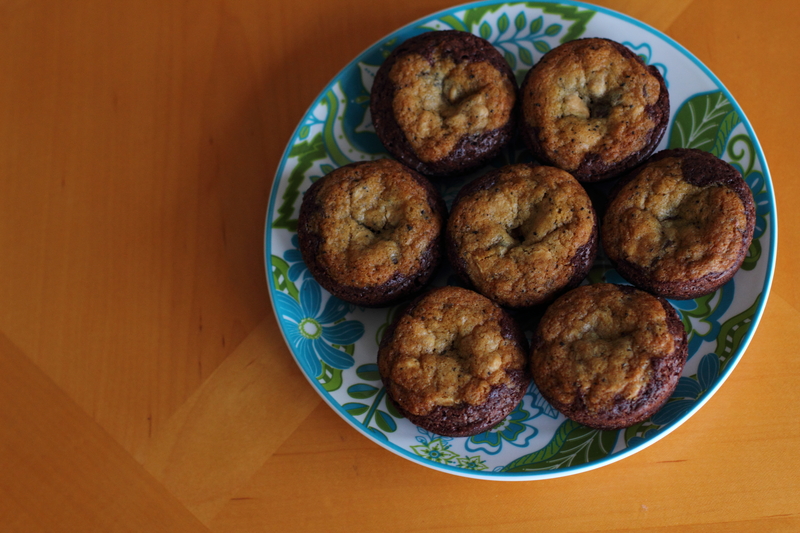 For an extra twist, I chopped up Snickers I had in the pantry and threw those in the middle of the muffins. Ahh, bliss! You might have some cookie dough left over. If you do, you can bake up a tray of cookies (Yay! Another pan to wash! ), or wrap up the dough and put it in the refrigerator or the freezer for a small cookie dough emergency. When I made these, I made the full amount of cookie dough from the original recipe and had a lot left over. For this post, I roughly halved the original recipe. Preheat the oven to 350˚ (I had the oven a little below 325˚, probably around 315˚.) Grease two muffins pans with shortening and set aside. Halve Snickers lengthwise and then quarter widthwise (You’ll end up with eight small-ish Snickers chunks.) Prepare the brownie batter according to the box’s directions, except for adding ½ tbs. of instant espresso powder to the batter. In the bowl of a stand mixer fitted with the paddle attachment, cream the butter and sugars on medium speed until lightened in color and fluffy, about three minutes. Add the egg and vanilla and mix well. In a separate bowl, whisk together the flour, baking soda, and salt. Add the dry ingredients in two additions to the mixer, mixing until just combined. Add the chocolate and the peanut butter chips to the dough and combine. Fill each well of the muffin tin about halfway up the sides with brownie batter (I filled each well with a 1 ½ tbs. cookie scoop full of batter) Place three Snickers chunks in the center of each well on top of the brownie batter. Scoop a rounded tablespoon of cookie dough, roll into a ball, and then flatten the dough into a disc between your palms. Lay the disc over the top of the brownie batter. Repeat until the entire pan is finished. Pop the muffin pan into the oven for twelve to fifteen minutes, rotating halfway through. The brookie muffins are done when the cookie dough is golden brown around the edges yet has a hint of softness in the middle. Let the brookies cool completely before trying to remove them from the pan. The centers may collapse inward as the muffins cool. Once the brookie muffins are cooled, use the thin edge of a silicone spatula to work around the edges and loosen the muffins. After the muffins are loosened, slip the edge of the spatula down to the bottom of the pan and gently try to pop the muffins out of the pan. If they continue to stick, just keep working around the edge with the spatula. Sometimes the muffins split in half. That’s okay. Just set the top back on the bottom; it will still be delicious. You can even use those split muffins to make ice cream sandwiches. If you want to serve this warm with ice cream, I would suggest under-baking the muffins a little so that the middle is soft and gooey. Then, scoop the muffin out of the pan (It will probably fall apart. ), top with a scoop of vanilla ice cream, and drizzle with hot fudge. 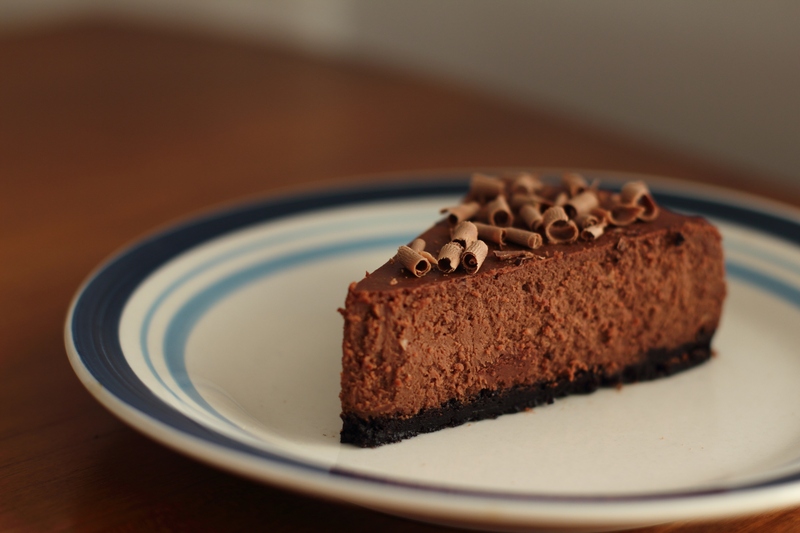 Mmm, cheesecake…creamy, dreamy cheesecake…creamy, dreamy, chocolate, coffee cheesecake. Need I say more? P.S. The crust was pretty soft from being refrigerated (It was kind of like the consistency of Oreos that have been dunked in milk.) The next time I make the cheesecake, I will probably try pre-baking the crust. Who knew that Hershey’s sells cookies ‘n’ cream kisses? I was surprised and elated when I discovered them at the store the other day. As soon as I saw my favorite Hershey’s candy bar flavor packaged in a kiss, I knew exactly what I had to do with them. I had to bake them into chocolate blossoms. At home, I searched around on the internet until I found a good-looking chocolate blossom recipe. I went ahead and made a batch of them. While they were definitely good, they weren’t quite what I wanted. A did a few tweaks that made them exactly what I had envisioned. I melted six ounces of semisweet chocolate chips and stirred two teaspoons of espresso granules into them. While the chocolate cooled, I creamed the butter and sugars. Then, I beat in the melted chocolate. After that, I mixed in the eggs, milk, and vanilla. Instead of adding a teaspoon of vanilla, I went crazy and added a whole tablespoon (I’m wild like that). The above things are the only deviations I made from the recipe. I will highly suggest, though, that you make the cookies with Dutch processed cocoa powder if you can find it. I made a batch with natural cocoa powder and a batch with Dutch processed. 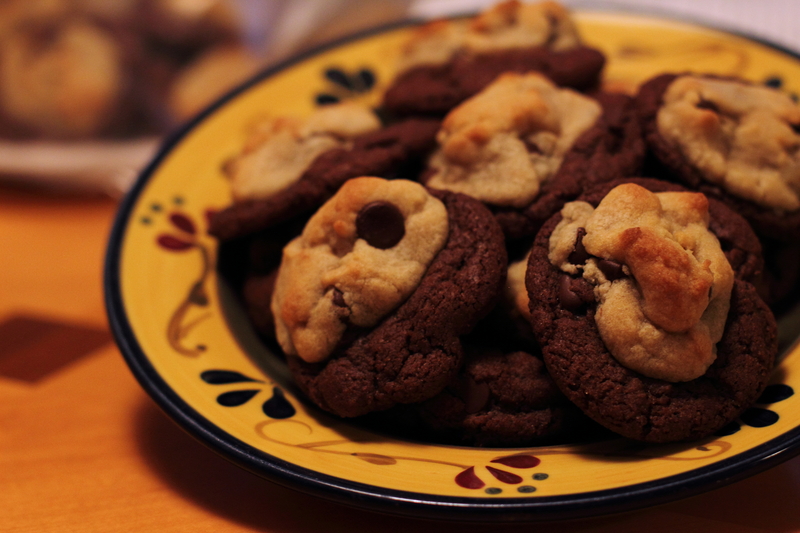 The cookies made with Dutch processed cocoa had a smoother, fuller-bodied taste. The ones made with natural cocoa were still extremely yummy, but they just didn’t have as finished a taste as the other ones. Either way, though, these cookies are delicious, especially with the sweet, slightly crunchy cookies ‘n’ cream kiss in the center. I like cute things. It’s true. Cuddly puppies, coffee mugs painted with polka dots—basically anything that makes me say, “Aww!” When cute can be coupled with delicious, I call that a win! Let me paint a picture for you. Envision a chewy, chocolate brownie. That’s delicious, right? Of course! Cute, though? Well, not exactly. Appetizing, yes, but not quite cute. Now, let’s think about a Reese’s peanut butter cup. That’s cute and delicious! How can we marry these two things together to create a cute, delicious dessert? Stuff the peanut butter cup inside the brownie. Duh! All right, here’s what you do. Mix up a nice, quick batch of boxed brownie mix (This dessert is pretty easy, too!) 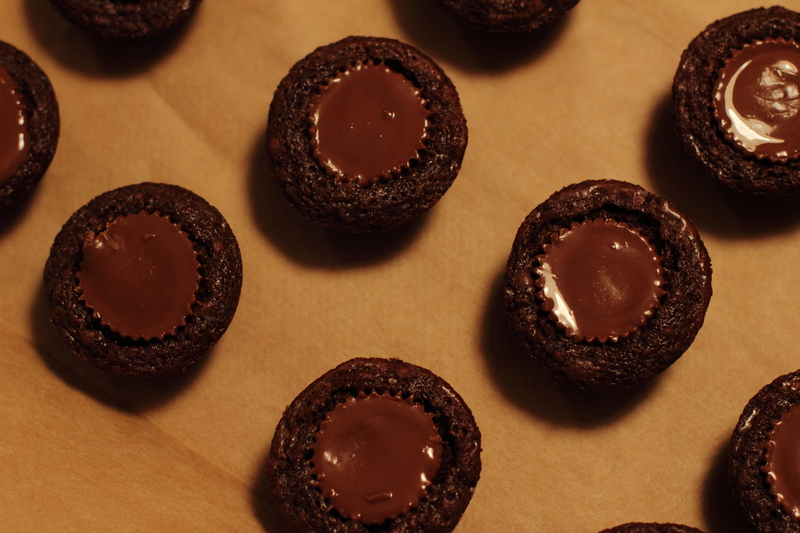 and bake up little brownie muffins in a mini-muffin pan. As soon as you pull the pan out of the oven, slowly press Reese’s peanut butter cups into the center of the brownie bites. It will look so pretty, especially when the peanut butter cups start to melt and the tops get all shiny. This made exactly thirty brownie bites, like the recipe said it would. Since I only have one mini-muffin pan, I let the brownie bites cool for about ten minutes in the pan. Then, I used the edge of a silicone cookie spatula and applied gentle, sideways pressure to one edge of a brownie bite. This made the brownie rotate in the well and come loose. Once it was loose, I gently popped the edge of the brownie up a little with the spatula and pulled it out with my fingers. You have to do this kind of quickly, though, because the melted Reese’s will flow over the side of the brownie when it is tipped backward. The brownies were nice and chewy, and the peanut butter cup center was creamy and, well, peanut buttery! I think that these would be a fun finger food to serve at a party. They’re also fun to have as a sweet treat around the house. Ooh! I bet you could make a base of a few of these on a plate and top them with a scoop of vanilla ice cream and a drizzle of hot fudge. That would be especially yummy if the brownie bites were still warm and made the ice cream nice and soft. Oh, the possibilities these present! Today I want to share a chocolate chip cookie. No, no, that’s a chocolate chocolate chip cookie. Wait! Hold on. It’s both! Yes, these black and tan cookies are the perfect solution for those indecisive days when it seems almost impossible to choose between wearing a comfy T-shirt or a cute cardigan or either watching a movie or reading a book. This cookie banishes the either/or and gives you both. I have found that sometimes when two food items are combined, the end result is disappointing. I would have preferred eating the two things separately. The black and tan cookies banish this problem, too. These two yummy cookies blend together perfectly. 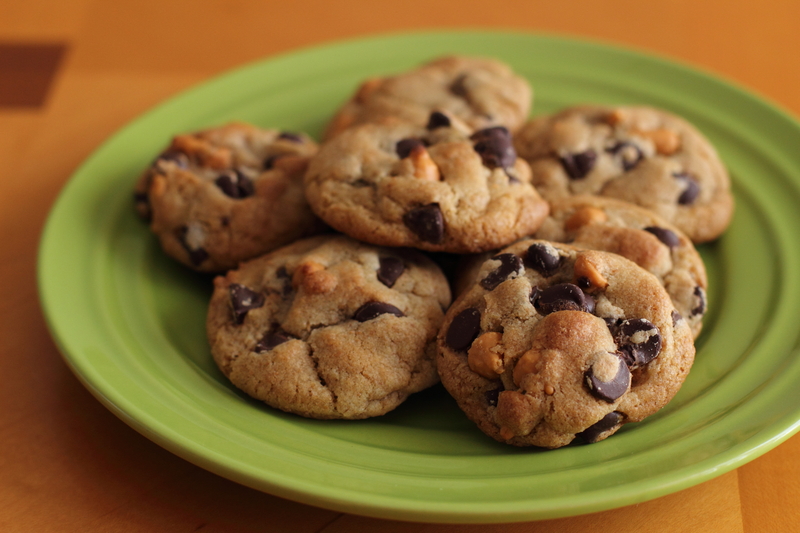 The richer chocolate base complements the buttery, classic chocolate chip cookie perched on top. When I made these, I found that the cookies turned out best when I placed the chocolate base on the cookie sheet and then firmly squished the chocolate chip cookie into the base. If I just lightly pressed them together, the cookies didn’t really bake up layered. The top cookie kind of slid off and made a bigger, half-chocolate, half-chocolate chip cookie. It was still cute, but I personally thought the layered look was a little more elegant. Plus, with the half-and-half cookie, you don’t get both flavors with each bite. In a small bowl, beat the egg and egg yolk together until combined and then sprinkle the coffee granules over it. Set aside to let the coffee dissolve (not all of it will) while you continue with the dough. In a large bowl, mix the butter and sugars together by hand. Give the egg mixture a good stir to incorporate the coffee and then dump it into the butter-sugar bowl, scraping as much coffee out of the small bowl as possible. Add the vanilla and stir to combine. Add the dry ingredients to the wet and mix until everything is just combined. Dump the chocolate chips in (and sneak a few for yourself while you’re at it) and give the dough a few final stirs to incorporate. After you’ve finished making the dough, just switch back to Natasha’s directions. By the way, don’t you just love how she styles her blog posts? Everything always looks so pretty and artistic! I love the flowers and the little pitcher of milk. 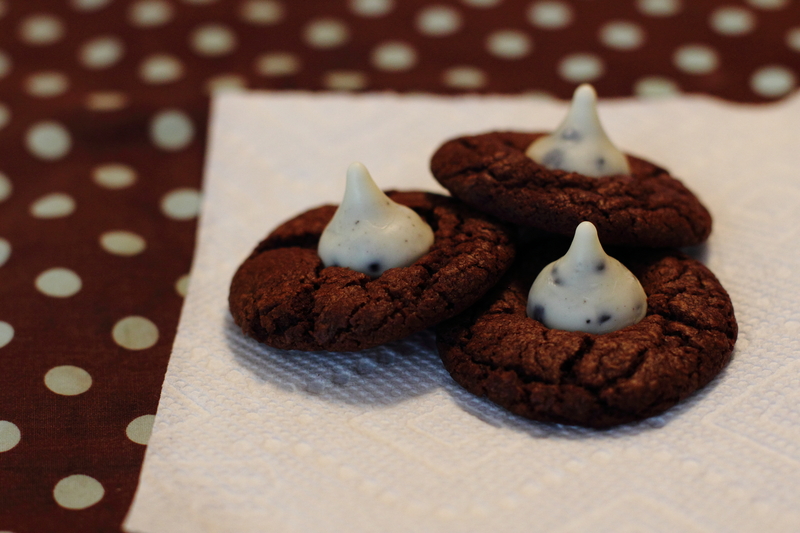 Anyway, these cookies are seriously delicious and really fun to make (and look at) (and eat). Oh, and I apologize for the rather warm tint of my photo. It was raining that day, and I had to turn the lights on to take the picture.